dog › Buy Poster of Two Siberian Husky Dogs Looks. Husky Dogs Black, Brown And White Coat Color. Closeup. Winter Sunset. 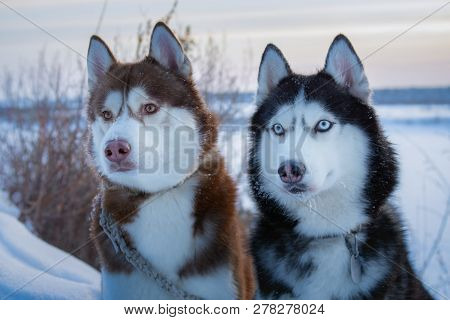 Poster of Two Siberian Husky Dogs Looks. Husky Dogs Black, Brown And White Coat Color. Closeup. Winter Sunset.